VE Commercial Vehicles Ltd., (VECV), a Volvo Group and Eicher Motors joint venture, last week launched an all-new range of trucks and buses, complying with environmentally friendly BSIV emission norms in Sri Lanka. Eicher Pro series, the range of next generation trucks and buses, brings together world class technology from the Volvo Group along with innovative engineering and proven DNA of fuel efficiency from Eicher. This takes Eicher trucks and buses in Sri Lanka, miles ahead in terms of technology, delivering higher productivity and prosperity to all its stakeholders. The VECV joint venture has had its base in the country for the last 5 years in the form of a wholly owned subsidiary- VECV Lanka Ltd. Eicher branded trucks and buses have witnessed significant growth in various usage segments in Sri Lanka, with strong brand equity in the commercial vehicle space. In fact, Eicher was the first CV player to introduce BSIII (Euro III equivalent) vehicles to the country, in line with the Company’s vision of driving modernisation. With the launch of this advanced technology trucks and bus range, Eicher Trucks and Buses plans to strengthen its presence across the segment in Sri Lanka and thus reinforce the Company’s vision of driving modernisation in the commercial transportation industry. Speaking on the occasion of the launch, VE Commercial Vehicles Senior Vice President and Head of International Business S. S. Gill said: “The Eicher Pro BSIV series is a newly developed range of future ready, durable vehicles capable of delivering unmatched efficiency, reliability, superior uptime and safety. The vehicles are equipped with next generation engines, coupled with the intelligent i3 EGR/SCR technology and driven by the latest engine management system EMS 3.0 from Volvo Group. This range for Sri Lanka boasts tough and robust aggregates, multimode technologies like M Booster, M Booster+ and Intelligent Driver Information Systems for best-in-class fuel efficiency and optimised operational cost, leading to quick returns on investment. Further, the vehicles are designed and tested with high standards of safety to meet the crash test requirements for the cabin, roll over requirements for the buses and fitted with anti-lock braking system (ABS), thereby ensuring safety to its users across the island. With this launch, Eicher also augments the construction segment range of tippers with higher productivity levels specifically for the growing infrastructure and construction industry in Sri Lanka. The light and medium duty buses that already enjoy a significant market share also further gets augmented with the new BSIV Skyline Pro range offerings. The haulage segments of both light and medium duty and heavy-duty trucks now include offerings with best-in-class features like cruise control and fuel coaching where the truck guides the driver, for more effective, fuel driving in Sri Lanka. As for the special USPs, fuel efficiency is the core of all products that are built by Eicher. “In the case of trucks, our core strength also has been offering a wide range of cargo body length which suits every kind of segment in the market, be it vegetables, fish, poultry, tankers, or containers, while in the case of buses, we have customised solutions for staff, school and city segments, with seating capacities ranging from 18 to 54-seaters. Our tipper range for the construction segment includes highly productive heavy-duty tippers with multiple capacity options. 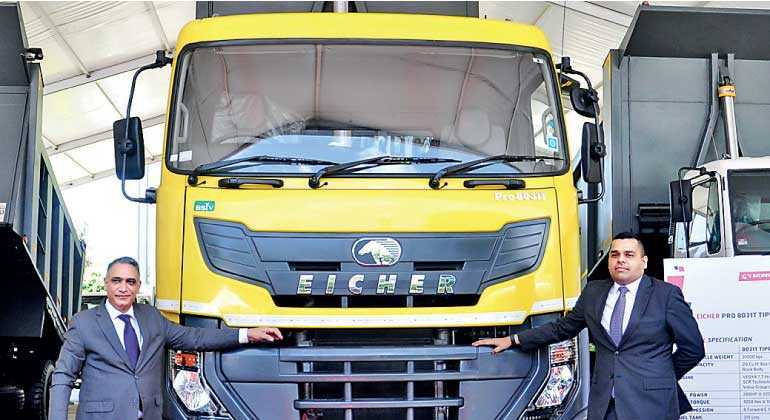 These next generation Eicher trucks and buses for Sri Lanka are poised to define new levels of productivity and fuel efficiency and drive modernisation with world-class technology and features,” said Gill. With regards to aftermarket and customer support solutions, Eicher offers innovative and customised service solutions to individual customer’s needs throughout the vehicle life cycle, from purchase to maintenance to resale. “Our unique offerings, like Dial-a-Part, Customised Service packages, customer driving training programs and mobile service vans, ensure quick response and maximum uptime for Eicher vehicles. Eicher also has a widespread coverage across the island for service and parts support to ensure customer convenience and service at their doorstep. Our workshops are equipped with the latest tools and equipment, coupled with regular mechanic trainings which ensure the highest level of productivity for our customers, leading to better profitability and prosperity for them,” said Gill.